The conjugate petroleum systems of the North Atlantic, finding hydrocarbons and developing the assets - all viewed through the oil-stained spectacles of geochemistry. The North Atlantic region has seen some phenomenal success over the last 60 years with first the hydrocarbon discoveries in the North Sea and then in Mid Norway and the West of Shetland regions. On the North American side the Jeanne d’Arc Basin has seen major discoveries and further north-east the Flemish Pass region has yielded good ones, as has to a lesser extent the Scotian Shelf. However, in the conjugate margin basins in Ireland (Porcupine Basin), the margins of Rockall, and further south in Brittany, offshore Aquitaine, Cantabria and Lusitania, exploration has been much less successful (Figure 1). 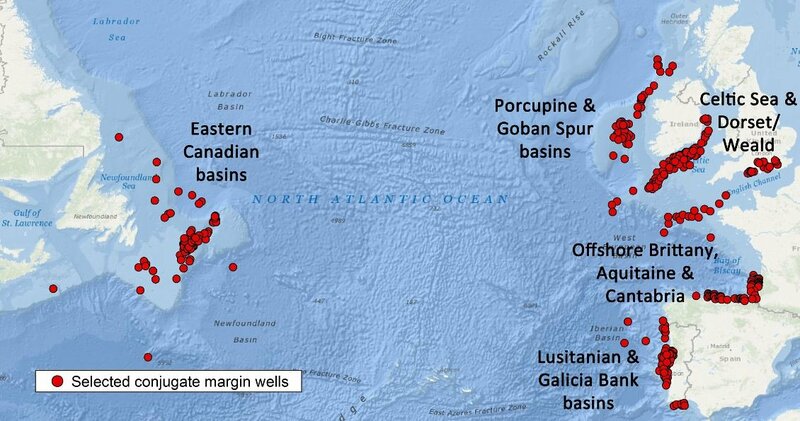 Figure 1: North Atlantic margin study area showing distribution of exploration wells. So what are we to make of the basins that have failed to date to yield commercial hydrocarbon discoveries? One of the key questions is do we actually have working petroleum systems in these basins? We regularly read in the press about a well apparently having discovered hydrocarbons in a new basin or sub basin or play and claims made that this proves there is a ‘working petroleum system’. Sometimes it is accompanied by encouraging flowed hydrocarbons as DST or MDT fluids that can be physically seen in a bottle on your desk. Great stuff. Sometimes the evidence is a little less certain. In any case, whether shows or flowed liquids, how can we be certain it has shed real light on what is going on in the deep subsurface? What does this ‘working petroleum system’ claim actually mean and how can we use this to develop our exploration concepts? As geochemists we know that hydrocarbons are highly mobile in the subsurface and that while we rely on the geologists and geophysicists to find the ‘bumps’ that we drill, the actual source of these hydrocarbons and shows are much deeper in the basin in the so-called ‘kitchen’ zone. This region is rarely explored as it is often below viable depths and where exploration targets are difficult to identify. In well records we commonly find hydrocarbon shows recognized either in the primary or secondary target horizons but log interpretation suggested there was insufficient potential or the mud loggers determined there was not enough reason to test. Sometimes this is a time constraint on expensive rig time or perhaps the shows were not even in the target horizon and there were no contingency plans to evaluate them. At the time the operator and partners probably decided to cut their losses and P&A the well or even relinquish the license. The evidence of shows in the wells, even where no further tests are undertaken, is proof of what is going on in the deep subsurface. So how can we determine if the reported oil shows are really a demonstration of a working petroleum system? Well, geochemists with their petroleum system hats on have various methods and means at their disposal to establish the facts. Figure 2: Wet cuttings through an oil-stained reservoir (note increase then decrease in color corresponding to oil concentration). Shows may be visible oil stain in core or cuttings (Figure 2), cut or fluorescence recorded at the rig site or elevated gas readings on the rig site chromatograph. Sometimes a lab may have been commissioned by the operator to do some basic work on the shows. However, what is often missing is a systematic, quality controlled dataset on the hydrocarbon evidence from the basin. In a frontier exploration area, where huge investment effort is to be made, unified evidence for the character and age of the source of the hydrocarbons is required. The ability to extract shows from rocks (proxy oils) is a key process which allows detailed characterization of the hydrocarbons. Such analyses allow us to determine information on the type of organic matter in the source rock, its depositional environment, probable age, the temperature at which it was generated and any processes of alteration the hydrocarbons may have experienced since generation, whether during migration or after entrapment. 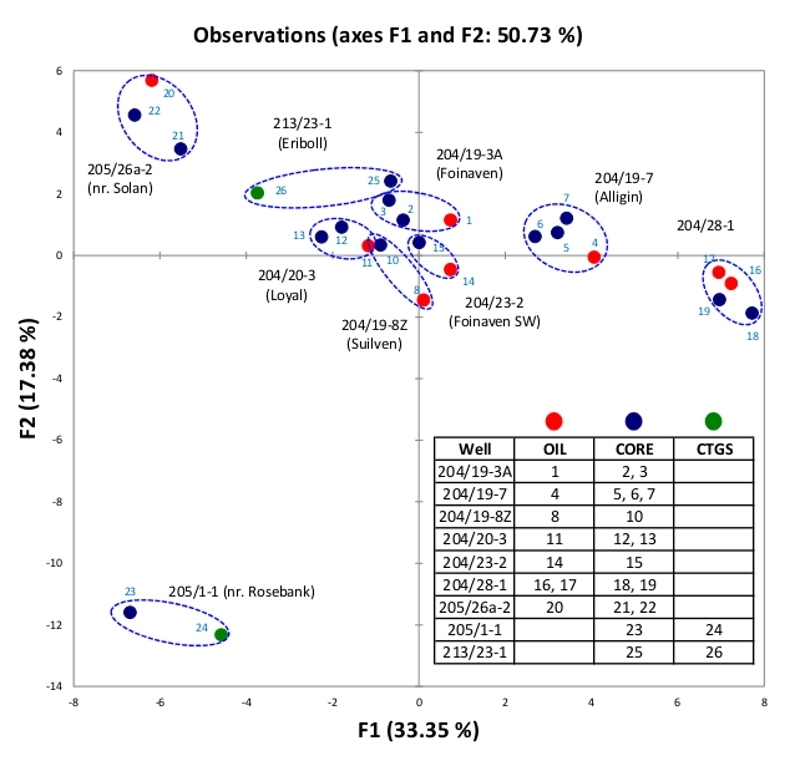 Figure 3: Comparison of chromatograms of flowed and proxy oils from a West of Shetland well (see text below for details). Figure 4: Statistical comparison of data from flowed and proxy oils. The analytical sequence begins with quantitative solvent extraction of the rock as core, washed or unwashed cuttings or even the whole wet cuttings. If the show is validated a solvent extract is obtained that can be quantified in terms of the amount of hydrocarbon recovered and a qualitative gas chromatographic (GC) analysis of the extract. 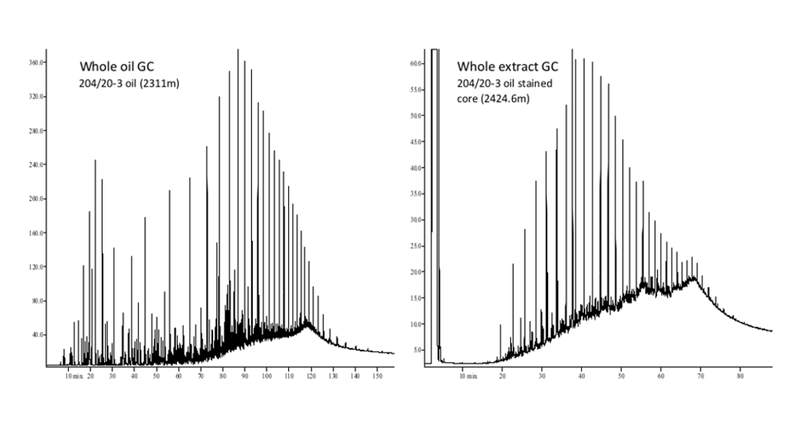 For example, we can readily demonstrate that the whole extract GC of a ‘proxy’ oil is highly similar to the whole oil GC of a tested zone (Figure 3, above) for a core from a proven oil field in the West of Shetland Basin. We can take this process of evaluation of the show much further by examining the high resolution biomarkers and the important bulk properties of the oil and the carbon isotopes of the extract or its fractions. In making this leap from a flowed to a proxy oil we need to be certain that what we are extracting is truly representative of the flowed sample. APT has established the close correlation of the parameters for core and cuttings extracts compared to the flowed liquids through extensive comparisons, a process validated by the PCA analysis of the biomarker data for a number of samples (Figure 4). In the case of the North Atlantic it is not enough to simply identify the presence of shows. The conjugate margins of the region have a complex rift-drift morphology and paleogeographic evolution with multiple potential source horizons. We need to know the geochemical character of the shows and what the data tell us about variations in source rock type and depositional conditions across the complex margins, so explorationists can better understand the petroleum systems they are dealing with and thus reduce exploration risk. To address the questions raised by the complexity of the conjugate margin and in an effort to provide tangible data points to constrain plate reconstructions and play fairway generation, APT UK have completed a major new analytical work program. 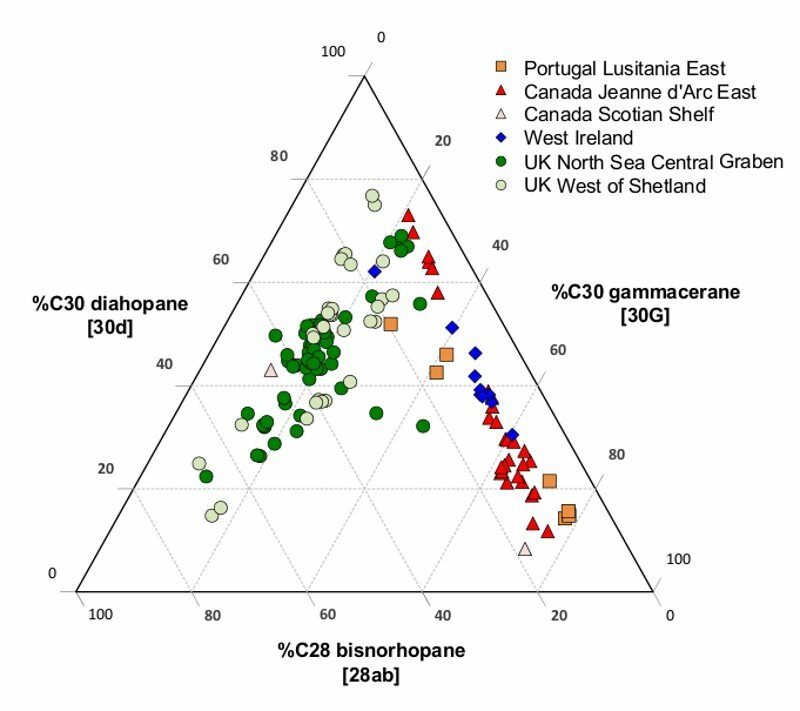 The objective has been to investigate the isotopes and biomarkers of source rocks and oils across the region, using new analyses of 102 oil samples from 90 wells from the Jeanne d’Arc, Flemish Pass and Orphan Basins on the Canadian side to the West of Shetland region, through the Porcupine, Celtic Sea, Wessex, Aquitaine, Galician and down to the Lusitanian Basin. Critically, this major new data set is augmented by the addition of new analyses on a further 288 samples of ‘proxy oils’ in 116 wells obtained through solvent extraction, as described above. Figure 5: Relative abundances of three source dependent biomarkers. Surprising differences in the source rock character have been revealed. Quite apart from the variation in maturity of the sources, related to the temperature at the time of generation, there are big differences in source input markers. Figure 5 compares the relative abundance of three important source dependant biomarkers, each of which has significance. Gammacerane, for instance, is a marker for varying salinity in the water column while bisnorhopane is thought to be related to the intensity of bacterial activity in the sediment – it is present in particularly high abundances in the North Sea and West of Shetland Basins but present in very low abundance in the Porcupine and other basins to the south. 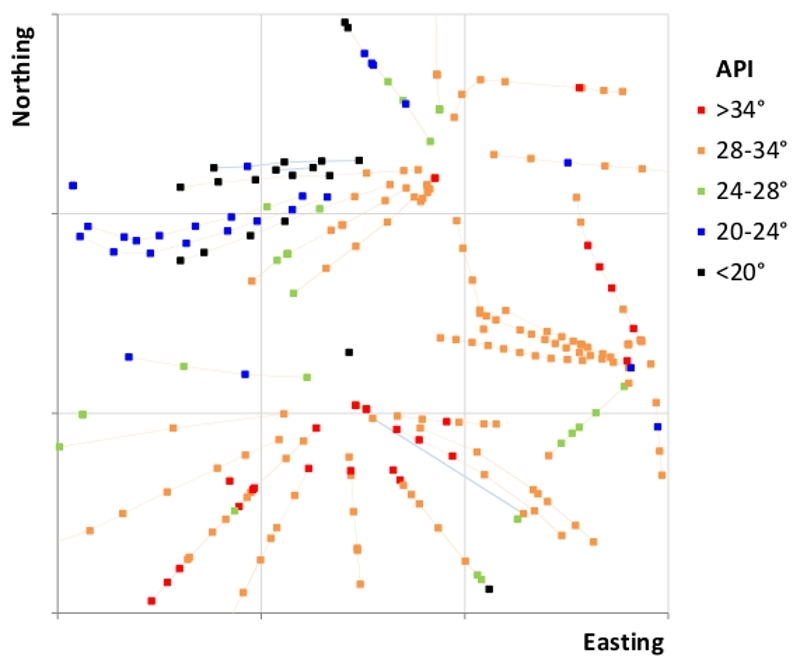 It can be clearly demonstrated in this ternary plot that the extracts from these different basins have strikingly different geochemical fingerprints reflecting major differences between the basins – but what is driving this? We believe these observed characteristics relate to major differences in sea water chemistry, organic input and most importantly differences in the water masses between the boreally influenced northern waters (West of Shetland and the North Sea) and the Tethyan influences in the basins further south (Eastern Canada, Lusitania and the Porcupine Basin). 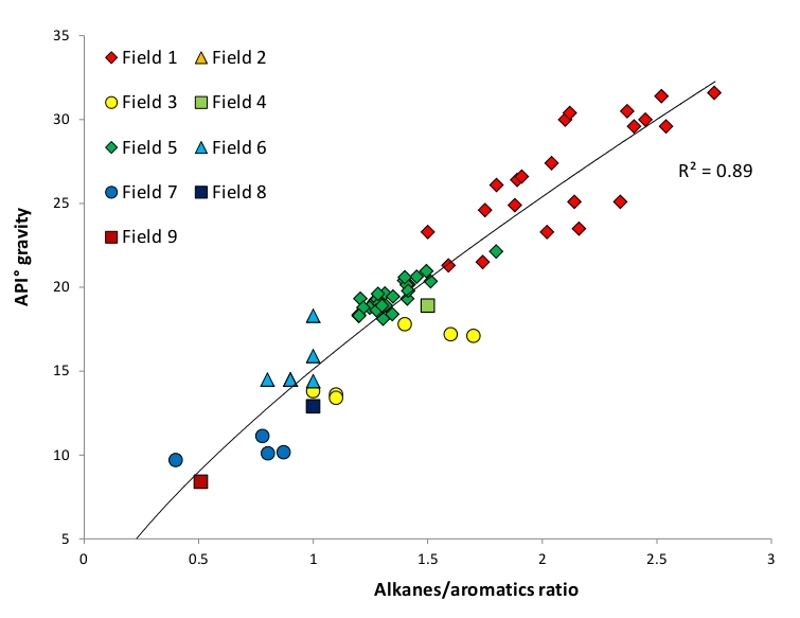 Figure 6: Correlation of API gravity with alkanes/aromatics ratios of flowed oils. Having established the source and post-generative history of the observed hydrocarbons, can geochemistry help in the development of these discoveries? Knowing the gravity, density and viscosity of the accumulation is key to effective production. The proxy oil approach can also be of value to the development of the resources found. Proxy oils extracted from cuttings are ideally suited to make predictions about the type of oil encountered without having to acquire a physical sample for PVT and assay. 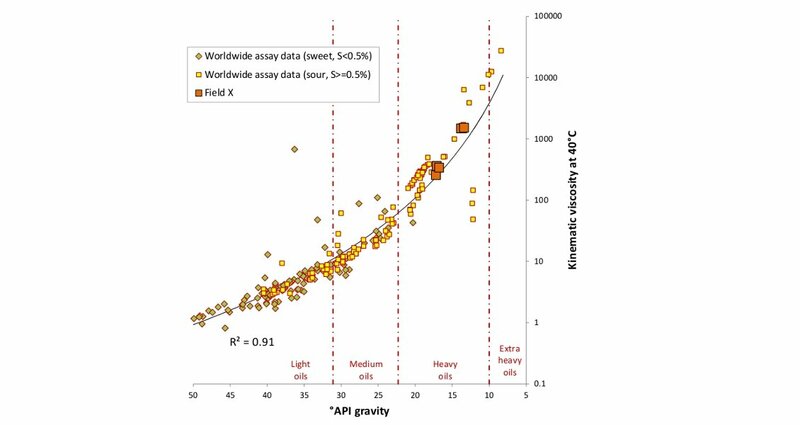 This can be particularly helpful where the oils are degraded by bacterial activity as it becomes possible to determine the probable density (API gravity) and viscosity, key parameters to assess in development (Figure 6). This approach has been used in many projects where core or cuttings from legacy wells have been utilized. It is to be noted that having access to high quality laboratory procedures enables us to establish a positive relationship between the measured gravity of flowed oils and proxy oils extracted from core or cuttings. Figure 7: Example distribution map of predicted API gravities across an oil field. This method has also been employed in projects where oil in large, apparently pressure-related fields can be shown to be varying in quality because of the lack of sufficient time for diffusive mixing to homogenize the field charge. Figure 7 illustrates the results obtained using this approach in a large, low amplitude structure within a relatively low permeability carbonate reservoir. The results have been obtained using oil extracted from unwashed wet cuttings taken from long lateral wells and the density calculated using the bulk composition calibrated to the results from flowed oil samples. These approaches can be taken even further where understanding how not just gravity but estimation of the often more important viscosity parameter is required. In these cases a range of parameters has been cross-correlated so that gravity and viscosity can be determined independently using high resolution biomarker analysis data (Figure 8). The various tools available to a geochemist, particularly when integrated with basin modeling and geological analysis, can provide significant insights to multiple aspects of a petroleum system. The forensic investigation and analysis of shows provide a valuable and highly cost-effective set of observations that enable both constraint of established exploration models of the subsurface and perhaps the spark for the creation of new models and ideas which drive value creation in petroleum exploration. APT is a geochemistry and basin modelling consultancy which provides a broad range of analytical services, modeling and consulting. The combined management and technical team can call upon over 200 years of geochemical experiences and in-sights to E&P industry applications. Established in Norway at the turn of the Millen-nium and born out of the merger of Saga and Norsk Hydro, the company has grown from its beginnings in Oslo to have bases in Norway, UK, Calgary and Houston. With a staff of over 40 specialists and technicians, APT has global experience across the Americas, Africa, Europe, the Middle East and Asia. Multi client and proprietary studies are available at basin, prospect and reservoir scale in the UK and internationally.